Book Reviews: 'A Gesture Life,' 'Maggie, A Girl Of The Streets,' 'Call It Sleep' Every new generation of immigrants must meet the age-old challenges of building a new home — assimilation and conformity, old habits and new cultures, adjustment and isolation. Author Helene Wecker shares with us three books that explore the complexities of life on foreign shores. 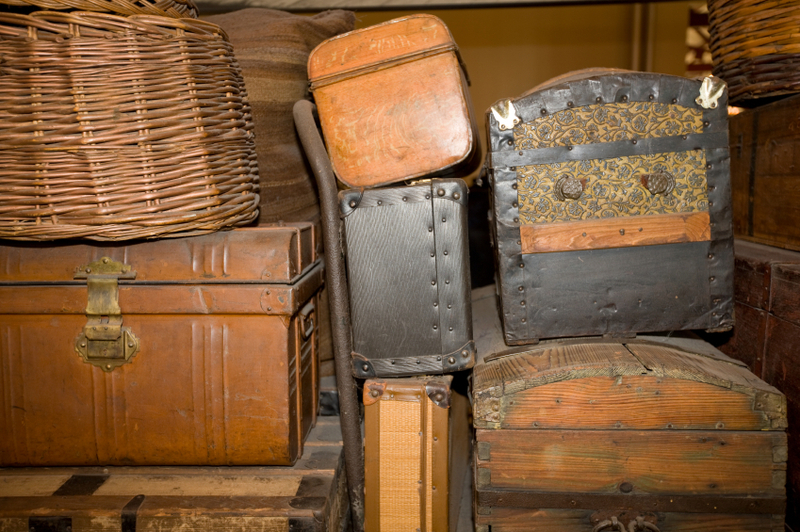 Old suitcases displayed in the Ellis Island Immigration Museum in New York City. Can there be any experience more kaleidoscopic in its emotions, more full of hopes and fears and just plain confusions, than that of coming to America? I'm no expert, certainly — but my research on immigration for my recent novel, as well as my own family history, points to a process of continual surprises, endless adjustments, and, at times, exhausting isolation. Old habits crash up against new ideas; the desire for a "clean slate" is betrayed by the inevitable baggage of a former life. The three books in this list (two classic and one modern), besides simply being fantastic reads, lay bare the complexities of immigrant lives in all their panoramic variety. Franklin "Doc" Hata is a familiar face in Bedley Run, the genteel New York suburb where he's lived for 30 years. A Japanese man of Korean descent, Hata whiles away his retirement in quiet solitude, until a series of small events — the shuttering of his former business, a fireplace that blazes out of control — begins to disturb his composure. Chang-rae Lee builds a tense portrait of a man who's spent his life erasing parts of himself, first to hide his Korean heritage and then to gain acceptance in his new American life. Interwoven with Hata's story are memories of his time in the Japanese army, and the atrocities he witnessed (and tacitly allowed) as the medical officer for a group of Korean "comfort women." It's the early 1890s, and the Bowery is the most notorious street in New York, home to the poorest of the newcomers. Young Maggie Johnson, the daughter of Irish immigrants, dreams of rising out of the slums. Instead, she's slowly pushed towards destitution by her monstrous mother, her street-tough brother, and her jerk of a boyfriend. Like his own characters, Crane pulls no punches; in the memorable first chapter, the Johnson children come home from a gang fight only to hide in terror from their brawling parents. Maggie can seem quaint and dated: there's condescension in Crane's high narrative perch, and in the pidgin dialogue littered with "Hully gee"s and "Ah, what deh hell"s. But there's a distinctly feminist message in Maggie's fall, and in Crane's slamming of the moral code that shuns "ruined" women while giving no blame to the men. A classic of Lower East Side Jewish life at the turn of the 20th century, Call It Sleep centers on David Schearl, a sensitive young boy fresh off the boat, and his initiation into the realities of adulthood. As a new American, David must contend with the privations of the tenements, the cantankerous rabbi who teaches him Hebrew and the constant threat of his father's anger. But the real star of this book is the language. Roth writes the Schearls' arguments and expostulations in distinctly Yiddish flavors and cadences, drawing you in so deeply that whenever the characters are forced to speak in their rough English, it sounds as jarring to you as it does to them. Like the best books, these immigration tales offer something more than just a good story. They explore issues vital to every new generation of American immigrants: assimilation and conformity, language and culture and the inability to ever truly erase the realities of one's past. Helene Wecker is the author of The Golem and the Jinni. Three Books... is produced and edited by the team at NPR Books.